Summary: What if everything you knew about your life was wrong? Yesterday, I was lucky enough to have Holly Robinson, author of THE WISHING HILL stop by my blog with a great guest post for my Book Club Exchange feature. As promised, I'll now share my thoughts on this novel about an extremely dysfunctional family! 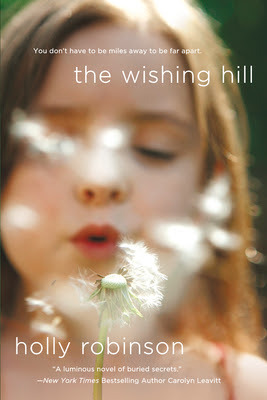 THE WISHING HILL tells the story of Juliet, a 40 year old woman lives in Mexico as an artist. She followed her heart (and what she thought was the man of her dreams) there, but now her husband wants a divorce and she's pregnant with another man's child. Needless to say, Juliet is at a major crossroads in her life; however, things become even more complicated when her brother asks her to come home to New England to help take care of their ailing mother. Juliet and her mother Desiree have quite the history. Desiree has had some success as an actress, but her personal life has been pretty dramatic as well. Juliet intends to stay only a short time until Desiree can take care of herself, but she quickly learns that even a few weeks will prove to be challenging when Desiree is lashing out and constantly belittling her. And then a mysterious neighbor enters the picture -- one with whom Desiree has major issues. As secrets from their past come to light, Juliet's life is forever changed; and what she thought she knew about her family is no longer true. Juliet has to come to terms with her past... and her future, and she also has to learn to forgive. As many of you already know, I'm always up for reading books about a dysfunctional families. And let me tell you, Juliet and her family give new meaning to the word dysfunctional! Juliet's mother is truly a piece of work and has quite the flamboyant actress personality. However, it's the secrets that her family has been keeping for over 40 years that make them truly messed up! The story centers around Juliet and, for the most part, I really liked her. There is no doubt that her life was a mess, but her heart seemed so genuine. I liked her inner strength and I found myself rooting for her to have some sort of normalcy in her life. Overall, I'd have to say that Ms. Robinson did a great job in developing her character and, thereby, keeping the reader's interest in what happens to Juliet. As far as the other characters go, I liked all of them (which is very unusual for me, by the way)... except for Desiree. I am pretty sure I wasn't "supposed" to like Juliet's mother because she was so cruel to Juliet and others. However, I almost found her to be stereotypical. Her caustic words and behavior were definitely over-the-top and hard to take, and my heart really went out to those she hurt. Having said that, one of the things that I appreciated the most about THE WISHING HILL had to do with Desiree's character. I can't say too much about a scene that occurs near the end of the book because I don't want to spoil things for readers, but suffice it to say that there is more to Desiree than meets the eye. This novel reminded me that no one is all good or all bad and that things aren't always what they seem. Furthermore, I appreciated how the novel ended. Things weren't totally wrapped up with a big fat bow and certain story lines were even left open-ended. There were so many issues for the various characters in this story that I would have felt cheated if everything had been resolved. After I finished the last page, I admit that I was still thinking about the characters and their futures. THE WISHING HILL would make an interesting book club pick. My trade paperback copy included a Conversation Guide that included an interview with the author and some discussion questions, but I wasn't able to find a copy on-line. Some of the themes you might want to discuss include family, parenting, mother/child relationships, sisterhood, forgiveness, secrets, redemption, honesty, and betrayal. I enjoyed THE WISHING HILL quite a bit and recommend it fans of women's fiction. I like family stories -- dysfunctional or not. That you still thought about the characters after you finished reading is a good selling point for me. Wow, Juliet's life is a mess! I like to read about dysfunctional families as well - I guess it makes me feel better about my own family. This book sounds so good! I've always loved stories about family dynamics, dysfunctional or otherwise. This book sounds good to me!